McDSP was set up in 1998 by Colin McDowell after previously working at Digidesign as a signal processing engineer helping to code the original TDM mix platform. He was also part of the team that created the Dolby E algorithm for Dolby Labs. Based out of Silicon Valley in California, McDSP were one of the first Plug-in designers to embrace the Pro Tools DSP platform and use Analog Modelling techniques way ahead of the game with their now legendary Analog Channel and Filterbank EQ. 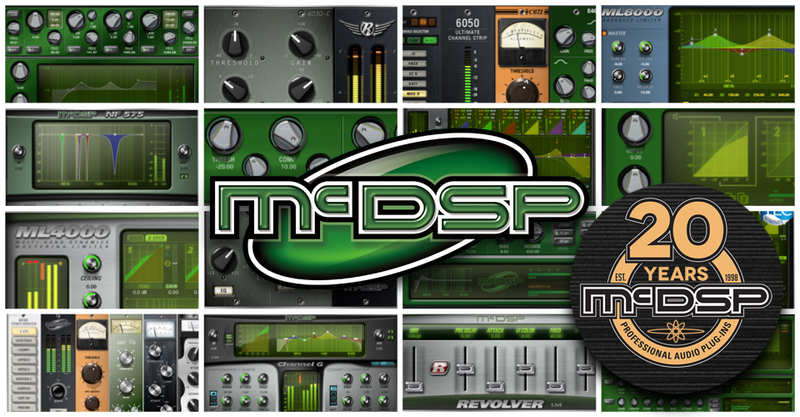 Having kept their range updated and the new power available on DSP and Native Systems, McDSP plug-ins now support AAX, AU and VST in two formats : Native and HD (for the AVID HDX DSP platform). McDSP were also first to provide a '500 Series-Style' selection of Plug-ins with the award winning 6050 Ultimate Channel Strip and the 6030 Ultimate Compressor. Known for musical and analog sounding software, McDSP has continued to design new unique Plug-ins for both the Music and Post market, with Colin himself providing tutorials and tips via his McDSP Colin's Corner and social media channels, with fans from the likes of Tony Maserati, Andrew Scheps, Michael Brauer and Dave Pensado frequently referring to them as essential in their workflow.